Ran-Cher Acres | Halifax Seaport Farmers' Market Ltd.
Ran-Cher Acres is a Dairy Goat operation that is owned and operated by Randy and Cheryl Hiltz and their two younger children Aaron and Sara. On our farm, that overlooks the beautiful Annapolis Valley, we milk 60 purebred Saanen dairy goats. 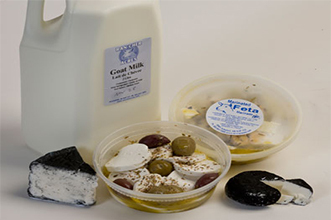 With the milk from our does we produce a variety of cheeses and yogurt. As well we raise pork, chicken, rabbit and beef.